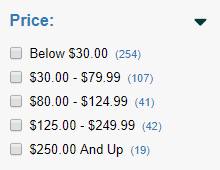 Search Magic pricing is relatively standard for most stores, although stores that have over 500,000 Unique Visitors, or more than 50,000 items may require custom pricing. The one-time installation fee for our Standard Search Magic setup starts at $399 and is dependent on the number of pages in Search and includes installation of responsive search template into your store, setup of standard filters*, adjusting the fonts and colors to match your store, and adjusting search results. If your store uses a separate mobile site (Yahoo's mobile or another 3rd party provider), that requires additional setup and adds a $100 one-time installation fee. 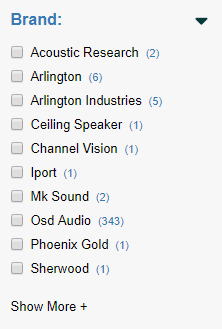 The one-time installation fee for our Standard Search Magic setup starts at $549 and is dependent on the number of pages in Search and includes installation of responsive search templates into your store, setup of standard filters*, adjusting the fonts and colors to match your store, and adjusting search results. * Standard filters include Price Slider (example: price-slide-filter.png), Range (example: range-filter.png), and Text List (example: list-filter.png) type filters. 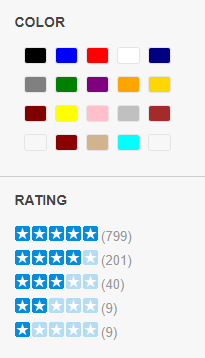 It is possible to create Custom filters (example: custom-filters.png) such as review stars or color blocks. We'll need to review to determine additional cost. Data source - utilizing the data within your Yahoo store is included in our standard installation. If we need to download or reference data from another external source we'll need to review to determine additional cost. Switching between the Horizontal and Vertical layouts may require additional programming and is subject to additional costs. Search Magic is a SaaS (Software as a Service) product and has a monthly (or yearly) cost. The average monthly fee is $75 (and is discounted for yearly licenses). Your monthly fee will be determined prior to the product installation therefore it will not come as a surprise later. Hosting for section pages may change the monthly fee slightly. Search Magic also works with other platforms such as Big Commerce and Shopify. Please contact us for pricing for these platforms.